My Newest Discovery in Spain? Olive Oil. 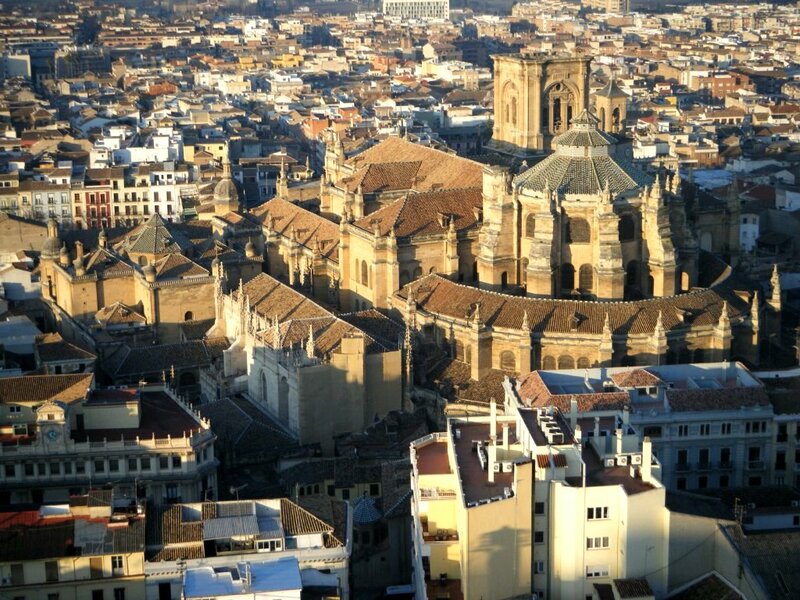 With every step through Granada, you’ll feel the push and pull of two very distinct cultures. Granada was the last city to be taken back from Muslim rule in 1492, but its Moorish history is still seen everywhere. Delve into a city full of beautiful architecture, grandiose buildings and stunning gardens. Wander up and down the hilly streets, and don’t forget to explore the city’s well-known tapas scene. Join us on one of our exquisite guided tours through Granada, and we’ll show you the very best the city has to offer. Here you’ll find pieces of those unique tours described in a little more detail. The Alhambra, a UNESCO World Heritage site, is an incredible piece of the past located on the top of a hill overlooking the city, and it sprawls across more than 100,000 square meters of land. 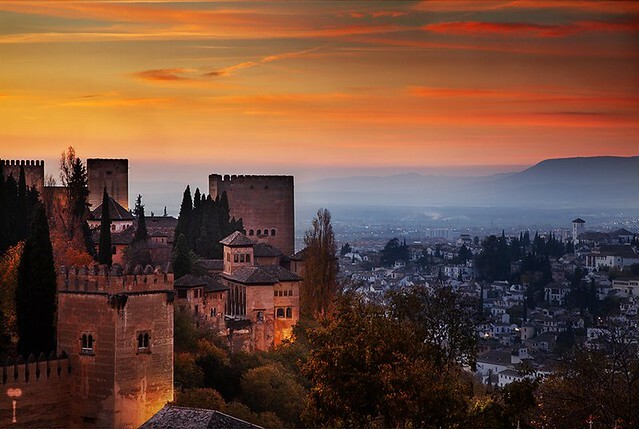 Within our Flavors of Andalucia tour, you’ll get to Granada in the afternoon and have a leisurely Spanish lunch while overlooking the splendid Moorish palace and fortress. After an afternoon of exploring Granada, we’ll guide you back to the Alhambra for an exclusive private night tour where you’ll weave your way through the keyhole doorways and rooms bursting with tile artwork and colors. This unique night-time guided tour of the palace is also offered with the Colors of Andalucia guided tour. Another beautiful stop to make in Granada is the Mirador de San Nicolas, which is located in the Albaicin neighborhood. It is the most popular viewpoint of the city, and for good reason. Let us take you there, discovering all of the Albaicin’s hidden treasures along the way, with the Colors of Andalucia guided tour. The views of the city, the majestic Alhambra and the Sierra Nevada mountains in the background, are well worth the 20-minute trek upward. Once you’re there, have a seat and wait for the sun to go down – you won’t be disappointed. While you’re in the neighborhood, the Albaicin is definitely one to spend some time in. This is Granada’s old Muslim quarter and located on the hill opposite the Alhambra. With our Flavors of Andalucia guided tour, after having lunch while overlooking the Alhambra, we’ll lead you through the neighborhood of whitewashed walls, winding cobblestone streets, tapas bars brimming with people, little shops lining the streets selling wonderful treasures from North Africa and luxurious homes with inner patios. As you’re walking around the Albaicin, you can’t miss Calle Caldería Nueva. It’s a bustling street filled with shops selling leather goods, handmade jewelry, Moroccan style tea sets and more. As you walk up this street, embrace the incense the shop owners have burning and stop at one of the many teterías for a warm cup of Moroccan tea. Once you’ve explored the Albaicin neighborhood thoroughly, the Sacromonte isn’t far from your path. Sacromonte is known as the gypsy quarter where gypsies have made homes out of caves for centuries. Head up this way to see the caves for yourself, hear the flamenco coming from the hills and even watch a flamenco show at one of the many available venues. We’d be more than happy to plan a night of flamenco within any of our tailor made guided tours. As mentioned before, Moorish touches are seen all throughout Granada, but there’s still a huge Catholic presence, which is evident when you step into La Catedral de Granada. This cathedral was built with force and with meaning. As soon as the Spanish had conquered the Muslims and had control of the city once again, Isabel la Católica ordered not only that the grandiose building be built, but that it be built where the city’s mosque had stood. When construction began in 1523, the plan was to create a Gothic-style cathedral, but when the project got a new architect five years later, Diego de Siloé convinced everyone that Renaissance was the way to go. Next to the cathedral, you’ll find the Capilla Real – or Royal Chapel – the place the monarchs of Spain envisioned as their eventual burial place. To this day, Queen Isabel and King Ferdinand remain there, as well as their daughter Juana la Loca. With all the walking you’re bound to be doing within this enchanting city, it’s safe to say you might be a little hungry. So, after a day of touring your way up and down Granada, you must go out de tapas, which means to grab dinner like the locals do by ordering a drink at a bar and enjoying the free tapa served with it for the small price of about 2€. You’ll have the chance to go out for tapas while on the Flavors of Andalucia tour, and it’s an experience that can’t be missed. With so many Spanish-style tapas restaurants to discover, it’s hard to stay at just one. Included in the Colors of Andalucia guided tour is an exclusive lunch of tapas at three stunning hand-picked tapas restaurants. Although tapas bars can be found all around the city, the most popular areas are the Realejo, the Carrera del Darro, Plaza Nueva, Paseo de los Tristes, Plaza de Toros, Calle Elvira and Calle Nueva. Finally, after everything, why not take a relaxing dip in an Arab bath? Arab baths are a completely unique experience and one of the best things we offer on our guided tours. Go in between warm and cold baths of water, get a full-body massage or relax in the steam room. Perhaps the best part of the Arab bath experience is the splendor that surrounds you, the bright tiles and inscriptions on the walls, and the keyhole arches welcoming you into each room. Please remember that we’re here to help you and to make your experience in Andalucia one-of-a-kind. Join us on any of our wonderful guided tours throughout the South of Spain, and don’t forget that we offer tailor made tours as well. © 2013 Andalucia Inside S. Coop. And., Agencia de Viajes Minorista Online CIF: F91989251, Domicilio en Calle Alcázares, 1, 3º Izquierda, 41003, Sevilla, Inscrita en el Registro de Cooperativas Andaluzas, en la Hoja SERCA04386, bajo el asiento nº1. C.I.A.N. 416113-2.